The Dunkirk evacuation, code-named Operation Dynamo, also known as the Miracle of Dunkirk, was the evacuation of Allied soldiers from the beaches and harbour of Dunkirk, France, between 26 May and 4 June 1940. The operation ws decided upon when large numbers of Belgian, Canadian, British, and French troops were cut off and surrounded by the German Army during the Battle of France. On the first day of the evacuation, only 7.669 men were evacuated, but by the end of the eighth day, a total of 338,226 soldiers had been rescued by a hstily assembled fleet of over 800 boats. Many of the troops were able to embark from the harbour's protective mole onto 39 British destroyers and other large ships, while others had to wade out from the beaches to the larger ships by what became known as the little ships of Dunkirk, a flotilla of hundreds of merchant navy boats, fishing boats, pleasure craft, and lifeboats called into service for the emergency. The British Expeditionary Force (BEF) lost 68,000 soldiers (dead, wounded, missing or captured) from 10 My until the surrender of France on 22 June. 35,000 British were killed and 13,05 wounded. All heavy equipment had to be abandoned. Left behind in France were 2,472 guns, 20,000 motorcycles, and almost 65,000 other vehicles; also abandoned were 377,000 tonnes of stores, more than 68,000 tonnes of ammunition and 147,000 tonnes of fuel. Almost all of the 445 British tanks that had been sent to France with the BEF were abandoned. This book is by Stratus, located in Sandomierz, Poland. They are associated with Mushroom Model Publications (MMP) in the UK and they print all of MMP's books there in English. Stratus also does their own line of books in both English and Polish. Stratus sent me this book and an associated book titled "Dunkirk 1940, Through a German Lens" in a bubble lined envelope. I have reviewed this other book elsewhere here on Indy Amps. This book is soft-cover of 32 pages in 8 1/2" x 12 page format. It is very like a children's color book. The cover art shows a British Cruiser Mk. I tank as a line drawing, partially colored in green against a red background. The back cover has a Junkers JU-87 Stuka, also a line drawing that is partially colored in green and the cover arts of onther Colouring Book that Stratus/MMP publishes: Classic Fighters. The pages in the book have the printing across the 12" width. Page 1 is the title page. Page 2 has specifications for a Me-109E and a black and white photo of the aircraft with its tail on a jack and 2 pilots standing on the wing. It has a dark spine over a lighter color below, a dragon symbol on the sides of the nose and a fuselage no. 11. Page 3 has a line drawing of the aircraft to color. Page 4 has the specifications for a French Char B1 tank and a black and white photo of one parked in a field with 3 German soldiers atop it. Page 5 has a line drawing of the Char B1 to color. It is firing its turret gun and has the turret no. 192 on it. Page 6 has the specifications for a British Bristol Cruiser Mk. I tank and a black and white photo of one with a German soldier sitting atop the turret. It has a light colored triangle with HQ in the center of it on the sides of the turret. Color of it is undetermined. Page 7 has a line drawing of it to color. page 8 has the specifictions for a British Hawker Hurricane Mk. I and a black and white photo of a crashed one, with a lot of fabric and panels removed. Page 9 has a line drawing of it in flight to color. Page 10 has specifications for a German Junkers Ju-87B Stuka with a black and white photo of one sitting on a grassy airfield, with a mechanic on the wing assisting the pilot. Page 11 has a line drawing of the Stuka to color. Page 12 has specifications for a British Light Tank Mk. VI. It is sitting on the beach at Dunkirk with a German soldier looking at it. Page 13 has a line drawing of the Mk. VI to color. Page 14 has specifications for the German Pz.Kpfw. I and a black and white photos of 2 of them parked in a field near a tree line. Page 15 has a line drawing of the tank to color. Page 16 has specifications for a German Pz.Kpfw. II and a black and white photo of 3 of them moving down a road with men sitting atop all of them, past a civilian woman and child. Page 17 has a line drawing of the tank to color. Page 18 has specifications for the German Pz.Kpfw. III and a black and white side profile photo of one with its turret side door open and showing a crewman inside. Page 19 has a line drawing of the tank to color. Page 20 has specifications for a German Sd.Kfz. 251 half-track with a black and white photo of one parked in a forest. Page 21 has a line drawing of the half-track to color. Page 22 has specifications for a French Somua S-35 with a black and white photo of an abandoned one with its side hull door ajar. It has a light colored plate with 119 on it on its sides. Page 23 has a line drawing of the Somua that shows smoke coming out of its gun to color. Page 24 has specifications for the British Supermarine Spitfire Mk. I with a black and white photo of one destroyed and laying on the beach at Dunkirk. Page 25 has a line drawing on the aircraft to color. 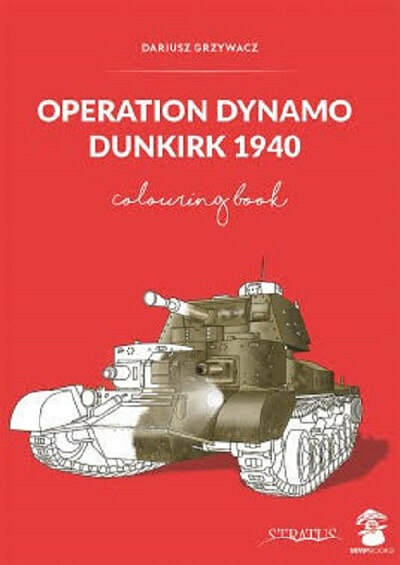 Page 26 has a description of the evacuation of Dunkirk. Page 27 has a line drawing of a sail-boat with British soldiers wading out to it to color. Page 28 has specifications for the British Bedford OY 3-ton truck with a black and white photo of it, other trucks, a sedan and a sail boat shown abandoned on the beach at Dunkirk. Page 29 has a line drawing of the Bedord to color. Page 30 has specifications for the British Universal Carrier and a black and white photo of one with 3 bare-chested German soldiers around it. It has a light colored serial no. T.14097 on its sides. Page 31 has a line drawing of the carrier to color. Pare 32 is the title page. Well, get out your crayons folks. This is a book that I said you are supposed to color. It will keep readers amused I'm sure and out of mischief and off the streets. I want to thank the folks at Stratus who sent me this sample and Roger Wallsgrove, Editor-In-Chief of MMP for this sample.